Jeep claims the Hurricane concept is the most maneuverable, most capable, and most powerful 4x4 ever built. 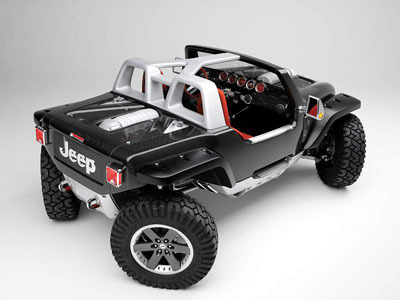 The Jeep Hurricane's one-piece body is composed largely of light-weight carbon fiber. The Hurricane's body also serves as the chassis, and all of the vehicle's components such as the engines (yes there's two! ), transmission, and suspension system are mounted directly to the body. The skid plate is an aluminum spine that connects the chassis to the underside of the vehicle. The Hurricane doesn't have side doors or a roof, and there is only seating for two people. Powered by two 5.7-liter HEMI engines - one in the front and one in the back - making a total of 670 horsepower, and driving all 4 wheels, the power is certainly there! And with fully controllable 4-wheel steering so is the maneuverability. So Jeep's claims are probably true! Sadly for 4x4 aficianados, the Jeep Hurricane is just a one-off creation with no plans for a production run.